As a student of Asian martial arts for  years and a teacher for , my thinking about the function and value of studying these disciplines has undergone a number of changes. My ideas were, naturally, strongly tied to my experiences in training. In retrospect, my meanderings in the martial arts appear to have followed a sequential pattern of development. This sequence might be acceptable in terms of the idea that all roads eventually lead to the same end. Yet, I know that the pattern I will describe is something of an illusion. It is probably formed by the rational mind’s tendency to select certain memories of events from among many in the past and to arrange them in a way that seems logical and coherent. I began to study judo in Hawaii soon after World War II. I had done some wrestling prior to this, but when an opportunity to begin judo training afforded itself I took it. It became my major interest. I soon found, however, that my preconceptions about judo as the ultimate in self-defense were wrong. The judo I was learning was sport judo and not the kind of jujitsu and karate combination my reading had led me to expect. Nevertheless, I continued to practice and gradually found myself being caught up in this training. The competitive aspect of judo also attracted me. In addition, I slowly became aware of and interested in a Japanese way of doing things. After studying judo for eight years and teaching it for about four, I went to Japan (1956-1958) to continue my training. To practice judo in Japan had been my intention for a number of years, because judo originated there. While in Japan, I became interested in karate and began to study that art daily for about two years. Karate training differed slightly from that encountered in judo in that more of the training consisted of individual practice. Moreover, at that time, competition in karate was not as strongly emphasized as it was in judo. In 1958 I returned to New York and resumed teaching judo. Because of the rising interest in karate, I taught this as well. During this period I practiced kendo briefly and continued studying aikido with a friend who was a teacher of that discipline. I had studied aikido for a short time in both Hawaii and Japan. As the years passed, my approach to the study and teaching of martial arts continued to change. My earlier emphasis on self-defense and competition began to move more in the direction of training as a preparation for, or an aid in, living as fully and completely as possible. As I reflected on the changes my study of martial arts had made in me, I realized that my training had been something more than the surface, body strengthening, skill-producing kind. I became aware that an inner development was also intended and had occurred. The beginning of an interest in Zen also contributed to this change in my outlook. 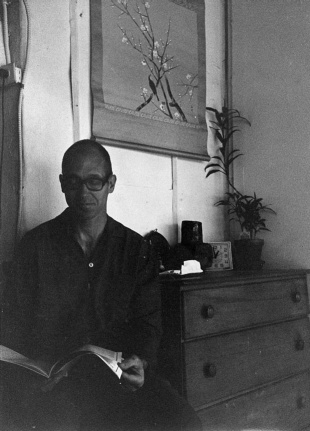 In 1963, I decided to go to Japan once again to study Zen and to continue my training in judo and karate. I stayed for about two years and then returned to New York where I began a study of tai chi chuan. Tai chi attracted me strongly because it combined the mental and physical aspects of martial arts training in the proportions I had come to feel were right for me. Presently, almost all my efforts are devoted to practicing and teaching tai chi. The ideas I hold about the direction in which martial arts training should go are not shared by all who practice or teach these arts. Among those who would generally agree with my point of view, a much smaller number would place primary emphasis upon inner development. Nevertheless, my experience in studying and teaching martial arts over a fairly long period of time has gradually brought me to my present view. My hope in writing this book is that I might turn others in a direction I have found very helpful for living. you were my first tai chi teacher in new york at the ?ymca or ?ywca in the 1970’s, on the upper east side. nice to find you in the internet. I took lessons with you for 2 to 3 years at your loft in China Town, in the late 1970s. Prior to that, I took lessons from your daughter for a few months, as part of a continuing education program at Brooklyn College. I have always valued what I have learned from you during these years. Hope all is well with you, your wife and your daughter. I studied with you at the New School and then on Canal St over a period of several years. Although I have moved away from the practice of Tai Chi I am still respectful of the practice and have kept it as part of who I am as a person. From time to time when I when I feel the need I bring out your books and practice the form. It continues to offer me focus and helps me to sort things out. You taught Tai Chi to George Morrison’s acting company at SUNY Purchase of which I was a member. Your work and presence and the practice itself made a long-lasting impression on me for which I have utmost gratitude. It was during a very difficult period in my life. I found peace in doing the form. I am seeking to take tai chi classes, most of all for the spiritual and physical practice. If you are able to point me in the right direction I would be most grateful. Herman has spoken frequently at his seminars about the realization that :”We have what we need.” My impression is that you have the right direction; blessings on you. Seems like almost forty years have passed since I was your student on East Broadway. I spent last week doing my first vapassana (insight) meditation and you there sitting with me, at least in spirit. I am happy to have returned to doing the form and I have nothing but the deepest gratitude for all that you gave me. I send you blessings of peacefulness and ease. I only know you through your books. You have my thanks for them. While taking lessons at the School of Tai Chi NYC (Patrick Watson) I almost gave up than I found you book Tai Chi Handbook Copyright 1974 well your book saved me with it’s well writen instructions I was able to find my way, Now 34 years later I still use your book as a referance with my Tai Chi class in Delray Beach Fl. I studied Tai Chi with you in Pine Bush back in the late 80s. You left me with profoundly insightful memories. Many needed this lengthy digestive process to be fully appreciated. Thank you for all of it. I am a tenth year Yang’s Tai Chi beginner at Hong Kong, taking regular lessons from my teacher who is a student of Master Fu Qing Quan. We are quite aware of the essences of the traditional Yang’s Tai Chi which become a rare spices compare with today’s widely-spreaded but at the same time over-simplified teaching and practices. We still find it difficult todays to come into good books in Tai Chi at an intermediate level written in Chinese. I was very surprised when I read your book “Push-hands, The handbook for non-competitive Tai Chi …” written in English which explained the essences of the subject in a clearly understandable way – far better than 99% of Tai Chi books written in Chinese. We learnt a lot from you and we shall continue to do so. Since Tai Chi is one part of human beings common cultural treasure, I am glad to know that you are one part of it – one part that will last for a long time. I was your student for five years at the loft on Canal Street in the 1990s. Though I have not actively continued my tai chi studies, I have incorporated many of the essential lessons I learned from you into my daily life. While you might not remember me, you might recall a student who was a professional musician and who, upon returning home from touring, would always bring a bottle of an exotic beverage with which we would all toast after class. I am now interested in returning to tai chi and look to find a teacher in my home of Madison, WI who follows what I learned from you. With warm thoughts across the decades. Tai Chi the same as you. I wish you peace and happiness and I thank you for all you have done for me and others by teaching tai chi. I studied Tai Chi and Push Hands with you in your Chinatown loft in the early 1970′s. A group of us from class went up with you to Ulster County one fall weekend to help you work on the foundation of a house you were building there. We brought our tents and Myrtle did ALL the cooking for 3 days… We did the form together under the trees. I did not continue with my practice after that, but now at 62, I am learning the form you taught me – once again. I am very fortunate and very grateful to have crossed your path Herman, in body and in spirit. I was stationed in Japan in the late 70’s for three years and was very interested in the religion. After coming back the states I began studying the Tai Te Ching and about the same time I also bought your Tai Chi Handbook. I have been self taught using your handbook and at one time actually called you for advice. I will never forget how amazed I was that you took the time to talk to me. Thank you very much. That was 1998, and I still practice Tai Chi by myself her in West Virginia. I have became more interested in Taoism and use it and Tai Chi to develop myself spiritually. Your book change my life. Over the last year I found my way back to teaching the form and push hands at the Tri-State College of Acupuncture in NYC, where I have been working for a long time now…and now I’m starting classes at a new office in Rhinebeck NY. So my thoughts go out to you with gratitude for all the time we spent together and for inspiring my progress. You are always present in my classes. It has been sometime since I have practiced the Tai Chi form, but I would like to say, “you were the very best teacher/mentor/instructor that I have ever met. Also the friends if that time from your studio were all fabulous people that I learned a ton from. Thank you Jaime, Allen and Lucy for teaching me to dance. Allan and Lucy still here married with two grown up children. So glad to see Herman is still teaching Tai Chi in San Diego, sharing his wisdom with another generation. Love to all those who shared in Herman’s practice as we all worked to help each other grow. Thanks Peter for keeping this page alive. Good times with the dancing. I had the great honor of being your student in the ’60’s when you had a dojo in Brooklyn, off Kings Highway if I remember correctly. I just want to say you have had a large positive influence on my life. You are a wonderful teacher and a wonderful man. Hope you are well. I’m happy to see you’re still teaching. I’m still studying with Frank in New York, I showed up about a year ago after a few years absence (although I kept up the form) caused mostly by the illess of my parents and then my wife. We are now a school of old folks who do the same things over and over — and then suddenly a little breakthrough. Hope to see you again someday, we might visit San Diego. I am a Tai Chi player from the Southern Appalachian Mountains. I was introduced to Taiji about 14 years ago and study regularly. I recieved your handbook as a gift about 4 years ago . Thank you for your gift of knowledge. I hope to meet you and have a conversation one day. Until that time I wish you many good mornings. I am so happy to see you here online!!! I studied with you in New Paltz, NY and I have a copy of your Handbook. I look forward to sharing this information with many others.